Great post! We have 4 hens that we raised from chicks this spring, and are planning on getting 2 more (we’re thinking Polish because of their funky topknots) next spring. Our daughter had such a great time raising these 4 and has begged for more chicks to raise. They have been such a wonderful addition to our family. Pets that happen to lay eggs. Our coop probably cost about $400 in materials BUT we were able to use a lot of reclaimed/scrap lumber and my husband is a former contractor so he built it. We did buy new the insulation, hardware cloth and several sheets of 3/4″ plywood. Your hens are super cute! We have 2 Golden Laced Wyandotte’s and 2 Easter Eggers (they give us blue & green eggs). Good info for anyone considering raising chickens – it’s not like what a lot of people might think – ours come when called, sit on our lap, beg for scraps and are quiet and clean. It is some work with cleaning the coop and making sure they are fed & healthy but that is true of any pet. Thanks, Liz! Yes, our chooks seem to have gone through interesting behavioral phases. As chicks they were “clingy”, then as teens they couldn’t bear to be “seen around us”, and now as layers they think a human and food are one and the same! All they need to hear is our patio door open and they come sprinting over to the gate – it’s hilarious. Nice having a handy hubby to repurpose scrap materials – hey isn’t he the ‘chicken whisperer’? We had no clue that we’d get so attached to dem birds and agree that they do make wonderful pets and convenience store! Thanks for commenting, Sticks 🙂 It’s wonderful to be recipients of fresh eggs from happy hens! Whoops! Sorry Plangarden! The Sticks is actually your old friend Compostings. Wrong hobby that I logged into to comment. In any event, I’ve enjoyed the chicken info! Lovely! We’re not ready to take the plunge yet, but in a year or two I think we’ll have some chickens. Good idea, Laura; raising chooks is not something you want to plunge into head first. It’s a big commitment, and ‘being ready’ involves a lot of things to make the environment for them (and for you & possibly your neighbors) as pleasant as possible! Looking at your spread sheet you show organic price at $4.50 yet your showing sale price of $3… Why aren’t you selling at the organic price or near it? If you figure your Chicken coup at 10 years to pay it off. and another $500 or so for servicing the building over 10 years thats $2,500 @120 months or near $21. Feed at $35 today. somewhere near $56 with out figuring replacing chickens, but that can be offset with eating them or selling manure for gardeners. 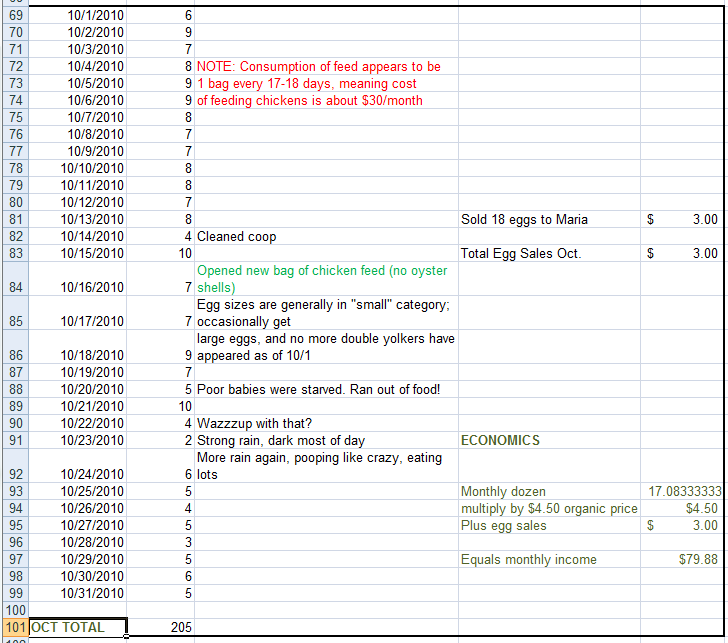 If someone wanted to pay for their chickens with egg sales and keep 4 or 5 dozen eggs a month they need to sell them at 17-5=12 to sell $56/12=$4.66 to get back some of your expense. Seems to me it’s worth while for the peace of mind to get eggs free of contamination and the fact that they are simply best for baking with. Hi Tom – we’re selling eggs to *friends* at a discount which explains the difference of $3 vs. $4.50. And we often give eggs away when people do nice things for us as a way of thanking them. 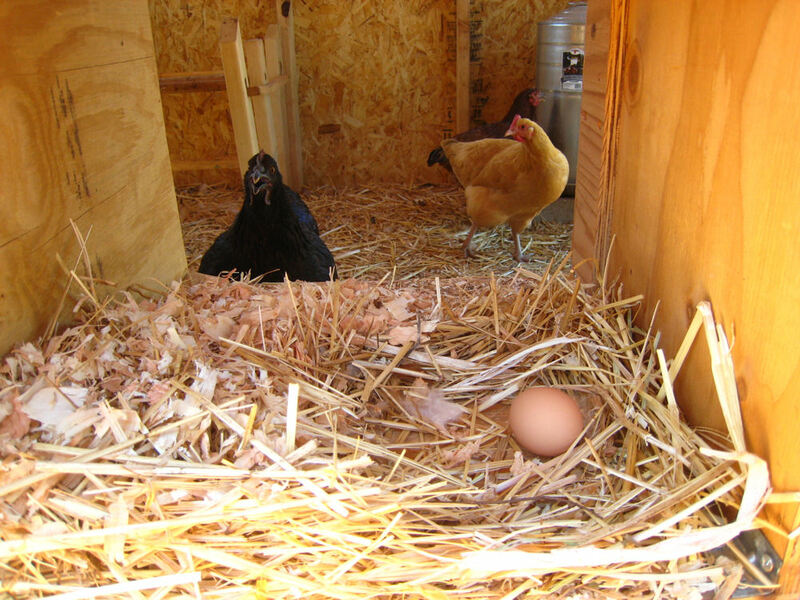 There’s no question having your own chickens free-range in fresh air with lots of room helps minimize the risk of disease. And yes they taste fantastic! It could be a fun money maker, though I’m reluctant to increase our brood right now. Seems 12 is the magic number at the moment, and by golly, they sure go through tons of feed (what a mess they make – eating like chickens! ).